Mehmet Uzun (1953 – 2007) was born in Sêwreg, a Kurdish city in Turkey, a country which could well arrest me for making such a claim in writing. The official government position is that Sêwreg is in fact called Siverek, and that there is no such thing as “a Kurdish city”. For the entirety of Uzun’s life, the Kurdish language was banned in Turkey and even the use of letters that exist in Kurdish but not in Turkish, such as Q or X, could lead to a fine. Indeed, the Kurdish author Mehmet Emin Bozarslan was imprisoned in 1968 for publishing something as basic as an alphabet book in this language that did not, could not exist. Writing fiction in a banned language was, then, both incredibly difficult and intensely political, something perhaps best exemplified by the fact that there were only six books published in Kurdish between 1923 and 1970 in Turkey. Uzun was jailed in 1976, when he was not yet a writer, on separatist charges for being the editor of a Kurdish magazine. “Separatism” has long been used against Kurds in Turkey, as the mere act of asserting there was such a thing as a Kurdish language is deemed an affront to the state. Upon his release eight months later, Uzun fled to Sweden, where he began to write fiction. The project that he embarked upon in his seven novels was frighteningly ambitious: he set to portray Kurdish historical figures in a hybrid blend of fiction and biography, while at the same time inventing a literary language for the Kurdish novel. This was especially necessary for Kurds in Turkey, who had developed a latinised alphabet in contrast to the Persian-resembling alphabet that Kurds in Iraq employed, which had more literary antecedents to draw from. There had been Kurdish novels before his, certainly, especially in the Iraqi part of Kurdistan where the laws were ever-so-slightly more lax in terms of Kurdish writing, but they were indebted to the conventions of the Russian realist novel. What Uzun set out to do was to imagine what a strictly Kurdish literature should look like, and then went about writing it. His Bîra Qederê, published in 1995, is perhaps his most ambitious undertaking. Telling the life of the Kurdish linguist and politician Celadet Bedirxan, who spent the 1920s and 30s developing the Kurdish latinised script in a vain hope to create a pan-Kurdish alphabet, the book purports to describe fourteen photographs taken during the course of Bedirxan’s life, each chapter a literal snapshot, photographs that the narrator grapples with, tries to understand, coaxing out meaning and context as they are described, in an impressive juggling of perspectives and narrative techniques. But Uzun’s most important accomplishment in the novel is that he uses Bedirxan’s own alphabet to write the story of the character’s life, a dizzying Borgesian loop, a time-travel paradox of sorts. The reason the novel has not been translated is a simple one: Kurdish literature is rarely, if ever, translated at all: the first and so far only translation of a Kurdish novel into English came out only last year. But let’s imagine for a moment that it remains available only in Kurdish because the novel itself is the story of that language, that a translation would rip out the novel’s very foundation, that publishers around the world would want nothing more than to translate this, but find themselves unable to separate the language from the story, deeming them too inextricably linked, succumbing to this fusion of form and content. Bîra Qederê remains, however, a novel in intense dialogue with both Kurdish history and western literature, riffing on the conventions used by Kafka and, especially, Borges, as it is never clear which, if any, of the described photographs actually exist and which are fictitious: even if Bedirxan came from a relatively well-off family, it stands to reason that there was no camera in his Kurdish village in 1893, while some of the later chapters describing photographs taken in Munich and Paris may well correspond to actual photographs found in one of the many archives Uzun consulted before embarking on the novel. The fact that he chose to write these biographies of famous Kurds as novels at all is also worth interrogating: partly the form allows for embellishment where the strict biography would not, granting the lives that had reached almost mythical status in Kurdish oral history a continued heightened place in history, verging on the unreal, but it also serves as a challenge to the reader: do you want to know what parts of this are true? Go ahead, research it. It’s as though Uzun’s novels, Bîra Qederê in particular, not only create a literary language but also create budding Kurdish historians in their readers. I would like to think that this is not a coincidence. Perhaps more so even than Borges, Bîra Qederê contains echoes of W.G. Sebald: not just in terms of the conceit to use photographs (included in Sebald’s novels, absent in this) or the circular narratives and obliquely alluded to tragedies, but also in the way that the work combines fiction and biography, a dash of memoir sprinkled within, and the manner in which both Uzun and Sebald deal with collective memory, equally adept at weaving historical figures into the narrative, equally dependent on a trauma — the Holocaust for Sebald, the ethnic cleansing of the Kurds for Uzun — running under the surface of the novels like baryte veins. For all that the real Bedirxan managed to accomplish in life (start a literary journal, study in Germany, travel across the world, and, oh yeah, develop an actual alphabet), his fate was ultimately tragic, as it must be. He died in poverty, having lived on the verge of ruin throughout most of his life, and no myth-making that Uzun attempted could get away from the one inviolable truth running through Kurdish history: happy endings are not for us. It is in that editorial aside, the “clarification needed”, that Mehmet Uzun’s fiction operates. Mehmet Uzun was born in 1953 in Sêwreg. He lived in exile in Sweden from 1977 to 2005 as a political refugee. His novels include Siya Evînê(“Shadow of Love”), Ji Rojên Evdalê Zeynikê(“From the days of Evdal Zeynikê”), and Ronî mîna evînê, tarî mîna mirinê (”Light as love, dark as death”). In 2002 he was charged with sedition and separatism by the Turkish state for an essay he had written on the Kurdish language. He died of cancer in 2007, aged 54. Agri Ismaïl is a Kurdish author based in Sweden. His work has previously appeared in The White Review, The Lifted Brow, and Guernica, amongst other places. 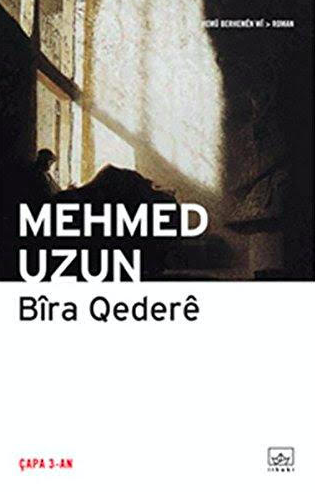 Posted in Book reviews and tagged Bîra Qederê, Mehmet Uzun, untranslated. Bookmark the permalink.